"The rosary is the book of the blind, where souls see and there enact the greatest drama of love the world has ever known; it is the book of the simple, which initiates them into mysteries and knowledge more satisfying than the education of other men; it is the book of the aged, whose eyes close upon the shadow of this world, and open on the substance of the next. The power of the rosary is beyond description." 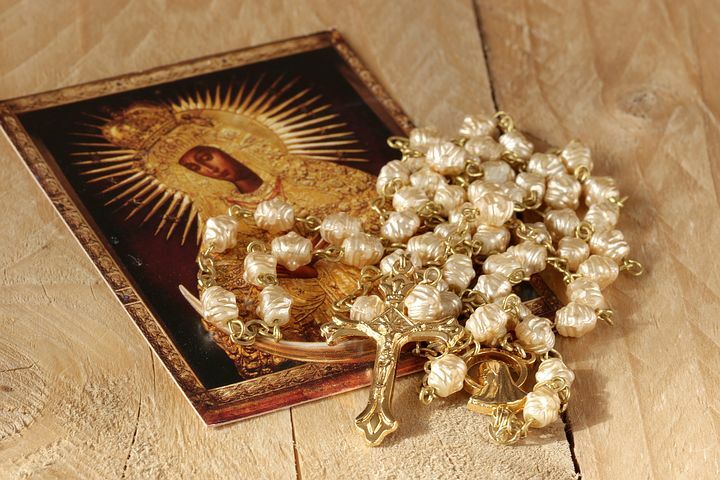 Sometimes called the "Bible on a String," the Rosary is a beautiful, ancient meditation of the Church dating back to the 13th century that uses beads to help count out prayers including the Our Father and Hail Mary. The required prayers involved in reciting the rosary are the: 1) Our Father, 2) Hail Mary, 3) Apostle's Creed, 4) Glory Be, and 5) Hail Holy Queen. Many also include the Fatima Prayer between decades. All prayers are either scripturally or thematically based. Additionally, the rosary is divided into decades or groups of ten prayers. Each decade is dedicated to a mystery of the life of Jesus. There are 4 groups of mysteries: 1) Joyful, 2) Glorious, 3) Sorrowful, and 4) Luminous. Use the button below to get more detailed information on how to pray the rosary. ... and carrying the cross by himself, he went out to what is called The Place of the Skull, which in Hebrew is called Golgotha. But he said to them, “Do not be alarmed; you are looking for Jesus of Nazareth, who was crucified. He has been raised; he is not here. Look, there is the place they laid him. A great portent appeared in heaven: a woman clothed with the sun, with the moon under her feet, and on her head a crown of twelve stars. His mother said to the servants, “Do whatever he tells you.” Now standing there were six stone water jars for the Jewish rites of purification, each holding twenty or thirty gallons. Jesus said to them, “Fill the jars with water.” And they filled them up to the brim.